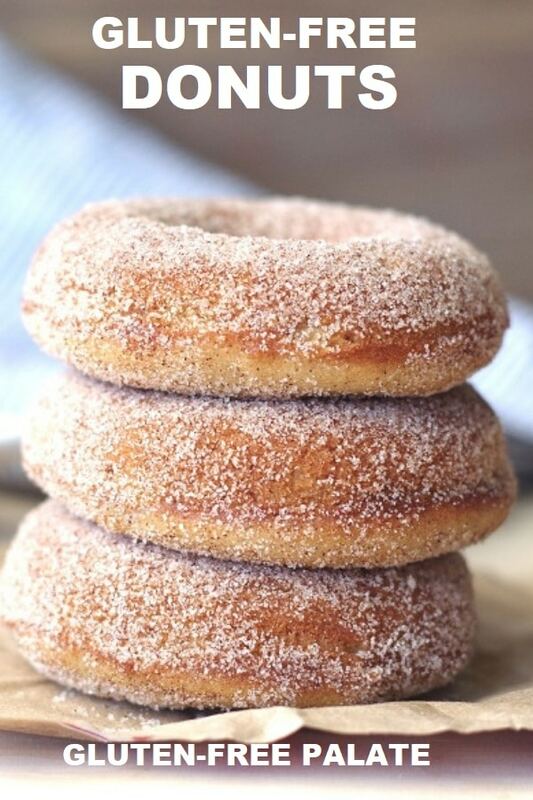 Warm irresistible Gluten-Free Cinnamon Sugar Donuts that are also dairy-free and nut-free. These donuts are ready in less than twenty minutes, and will melt in your mouth. Looking for an extra special treat? Top them with your favorite dairy-free vanilla ice cream and chocolate sauce. 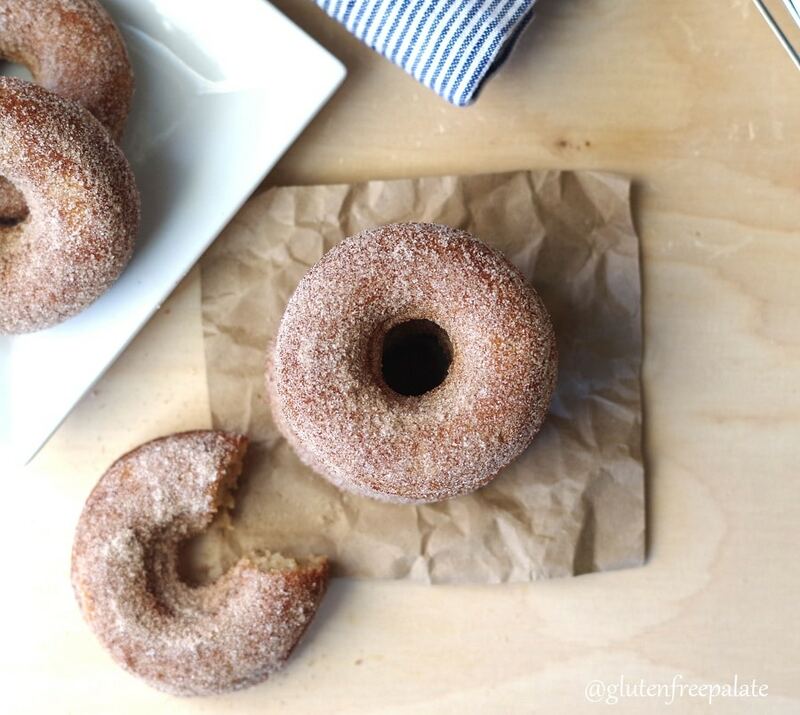 No one can resist a fresh, warm, gluten-free cinnamon sugar donut out of the oven. The wonderful smell of cinnamon baking into a perfect gluten-free treat wafting through the house is irresistible. Anytime I bake up a batch of gluten-free donuts my family comes running. I’ve been playing with a new flour blend lately and it worked wonders on this Gluten-Free Cinnamon Sugar Donut. Have you heard of RYZE gluten-free flours? It’s a 100% whole grain rice flour blend. They have two different bags, a yellow and a blue. The difference (from what I’ve read on their website) between the two is the combination of how fine they grind the flour. So for one bag you might have a mix of finely ground rice flour mixed with rice that’s not as finely ground. Make sense? It’s all rice flour, just different grinds. If you don’t have a bag of Ryze flour you can use Bob’s Red Mill 1-t0-1 gluten free flour blend (affiliate link) to make these gluten-free donuts, or you can use my homemade gluten-free flour blend. I also have a list of Best Gluten-Free Flour Blend Recipes you might want to consider. For the donuts: Preheat oven to 425°F. Grease one six-serving donut pan; set aside. In a large mixing bowl, mix the flour, brown sugar, baking powder, cinnamon, and salt. In a separate small mixing bowl, whisk the egg, vanilla, vegetable oil, dairy-free milk and vinegar. Add the wet ingredients to the dry ingredients and stir until combined. Spoon the batter into the prepared donut pan – filling each donut well about 2/3 full. The batter should not cover the center of the donut well where the hole will go. Bake for 9-11 minutes or until the donuts rise and set. Place a wire rack over a cookie sheet or piece of parchment paper. Carefully remove the donut from the pan. You may need to use a spoon or a rubber spatula to loosen them if they stick. For the coating: In a separate small mixing bowl, combine the sugar and cinnamon. One at a time, dip the tops of your donuts into the coating, then flip them to coat the bottoms. Place your cinnamon sugar donut on the rack and repeat until all donuts have been coated. Store donuts in an airtight container at room temperate for up to three days. 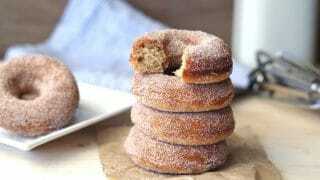 The combinations of ingredients in these gluten-free cinnamon sugar donuts yield delicious results. My friend Brianna from Flippin Delicious came to visit a while back and I knew I had to make her these donuts to see what she though. She was the first recipe developer that had the chance to try these, so I knew she’d give be honest with me about the texture and flavors. Yes. She swooned over them. I served her a couple on a plate alongside a fresh cup of freshly pressed coffee. It was the perfect welcome breakfast and I’m glad I got to bake for her. When I first tried RYZE I was skeptical. Most 100% rice flour brands don’t hold up to baked goods on their own. It’s best to mix them with other flours or starches. I’ve now used RYZE to make several of my donut and quick bread recipes and each one has turned out nicely. I mean, just look at these donuts. Did you see the texture in the picture at the top of this post? Perfect. These donuts have a really nice texture and they hold of for days. I made a double batch for my girls and then munched through them until the were gone. I’ve also frozen a batch so my girls can pull them out on Fridays and reheat them. They were still moist and delightful. When working with or measuring gluten-free flour, spoon the flour into the measuring cup and level. Do not scoop your measuring cup into the gluten-free flour. The best method really is to weight it but I don’t have the ingredient weights for all my recipes yet. 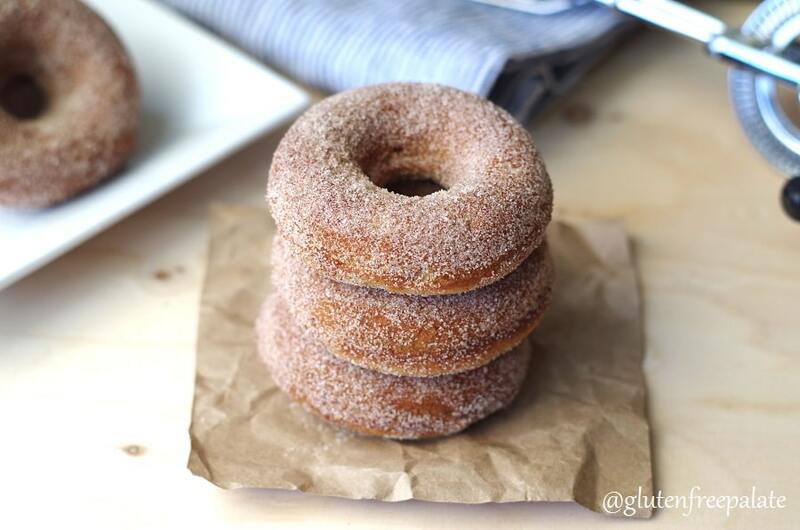 For these gluten-free cinnamon sugar donuts you can use a flaxseed egg. To make a flax egg, mix one tablespoon ground flaxseed meal with three tablespoons of water. Mix together, and let sit in your fridge for 15 minutes to set up and thicken. You can also try an egg replacer like Bob’s Red Mill Egg Replacer. I hear it’s easy to work with. For this recipe I used almond milk, which is a dairy-free milk. You can use regular milk or you milk of choice. 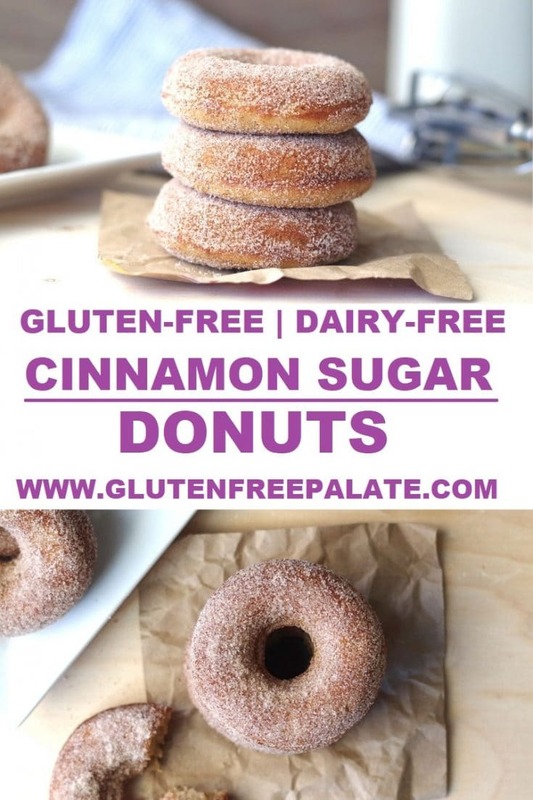 I recommend you don’t add buttermilk or full fat coconut milk to these gluten-free cinnamon sugar donuts. The milk is too thick, and has to much fat for the rest of the ingredients. If you like donuts (and hopefully you do) you should check out my Gluten-Free Gingerbread Donuts, Gluten-Free Vanilla Birthday Cake Donuts, and my Gluten-Free Vegan Espresso Donuts. My friend Biranna from Flipping Delicious has a wonderful Gluten Free Red Velvet Donut Recipe. All are amazing and all are super simple. If you are looking for more donut recipes, you can search for donuts in the search bar at the top. Did you make these donuts? Please let me know what you thought. If you have a question about gluten-free donuts or any of my recipes please leave a comment below and I will get back to you. 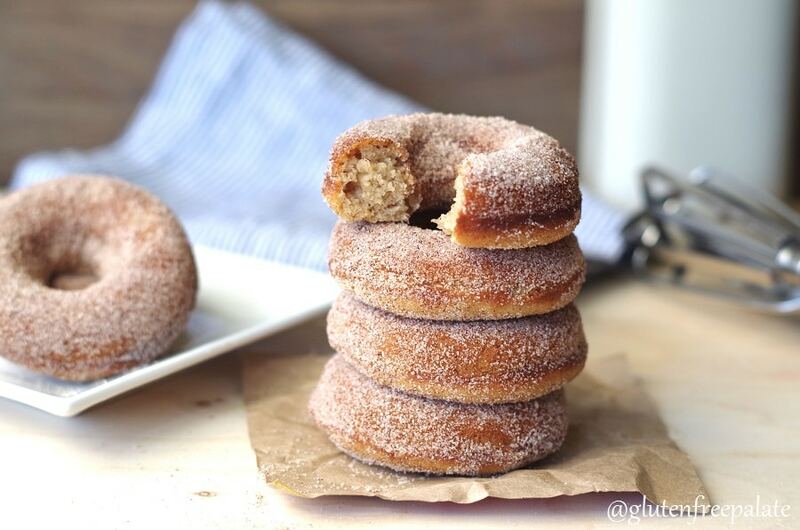 Warm irresistible Gluten-Free Cinnamon Sugar Donuts that are also dairy-free and nut-free. Spoon the batter into the prepared donut pan - filling each donut well about 2/3 full. The batter should not cover the center of the donut well where the hole will go. When measuring gluten-free flour, spoon the flour into the measuring cup and level. Do not scoop your measuring cup into the gluten-free flour. Well those just came out perfectly! I love cinnamon sugar doughnuts! I’ll have to try your version! I hadn’t heard of RYZE and am glad to know it is a good flour blend. Those are absolutely beautiful! Such a yummy flavor for this time of year. I love donuts! I have to try these! How happy would people be if I served those at my next brunch? Very! David would be in heaven if he woke up to donuts one day, so I might just have to give this a go!! What a perfect fall breakfast or snack! Love that these are dairy free too! The texture of these looks so spot on! I honestly can’t believe they’re baked let along gluten-free & dairy-free. We make them all the time now. They are our favorites! I am so happy that you baked these for me when I visited! They truly were amazing! I wish I had one to go with my coffee right now. Those look delicious! I want to come over and have one! These donuts look so perfect! Yum! THESE LOOK SO SO SO SO SO SO SO SOSOS good! I’m drooling right now. I have a GF flour blend already made up, do you think it would work in place of the yellow rice flour? If I just want gluten free, can I use milk or buttermilk? Yes, you can use regular milk in this recipe. These are amazing and easy!!!! !My two kids, husband, and myself ate all of them in a day! Chrystal, could I fry this dough? I noticed the pans make the bottoms a little flatter which isn’t a big deal, but wanted to try some fried. So glad you like them. Thank you for taking time to stop by and let me know. I don’t think these would fry well. So glad you liked them! We love these donuts too. Thank you for stopping back by to let me know! Could I use butter to replace oil in this recipe? Do u think I could use coconut sugar or xylitol in place of the brown sugar? I haven’t tried sugar substitutes in this recipe. Sorry! Different flours altar the taste? I haven’t tested this donuts with regular flour but I would imagine it would work. I made these last night for a large dinner party that we were asked to bring a dessert. I have two kids who have to eat gluten and dairy free so I wanted to bring something that they could eat too. They were a HUGE hit! I quadr The recipe so I could make 24 donuts, and they were nearly all gone in minutes. Everyone said they couldn’t tell they were gluten/dairy free. Success!! A couple of notes: the only gf flour I had On hand was Bob’s Red Mill 1:1 gf flour and it worked beautifully. Also, I definitely had to fill my donut pan more than 2/3 full but they still came out the perfect size. Thanks for a great recipe!! Thank you so much for taking time to come back and let me know 🙂 I’m so glad everyone liked them. We are egg free can we use egg replacer? I’ve used flax egg in this recipe. The texture is a bit different, but they are still yummy.